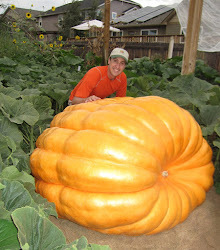 Giant Pumpkin Growing Tips From The Pumpkin Man: What is the Perfect Soil for Giant Pumkins? What is the Perfect Soil for Giant Pumkins? The short answer is a balanced soil that has all of the nutrients in the soil that the pumpkin plant would need throughout the season. The reality is that it is much more complicated than that. I got my soil test results back. Since this is a new patch and the soil is a bit different than what I had at the old home, I have more work cut out for me. The soil here isn't bad. It just needs to be properly built up and balanced. I did a conversation with the head scientist who is a soil genius. I've talked with him more than once over the years and with as much as I know, I don't know a thimble compared to what he knows. Good soil is all about chemistry and soil chemistry is pretty much like a jigsaw puzzle where some of the pieces don't always fit well. For example, my soil naturally has too much calcium in it. At 5,600 feet in altitude you would be surprised to learn that there are sea shells in my yard. The soil is an old ocean bed and the limestone has lots of calcium. Too much calcium puts the soil out of balance and as a result it can cause problems with other nutrients. The only good way to make the soil "perfect" so all of the pieces fit together would be to replace the majority of the soil. To some degree, over time, that is what I'll do, but no plans to haul soil Ohio to do a quick fix. Some growers think that if a soil isn't "perfect" you can't grow a big pumpkin. I can show you soil reports from growers who have grown world records that don't have balanced soils and did very well. I believe the key is to not be too out of balance and make sure you do the right things (i.e. foliar feeding) to adjust appropriately. One interesting conversation I had with the soil scientist was in regards to the rhizosphere around the roots. The roots can get to nutrients about 1/4 inch from them, so although your soil may have a lot of nutrients in it, you can have the plant "bonk" because it can only access so much so it gets depleted. I asked about feeding during the season and also about nutrients being locked up and he suggested an additional test to include on the soil. This test (75S) would show what is soluble and available to the plants which is a better indication of what a plant can use from the soil. I'm going to have another conversation with him after that test is done and I'll let you know what I learn here in the blog.